Thirteen years in the making, the proposed Lakeview Dog Park meets its fiercest resistance yet. Some opponents of the proposed dog run are concerned about the loss of open space. The question comes up again and again: Why would anyone oppose a dog park? 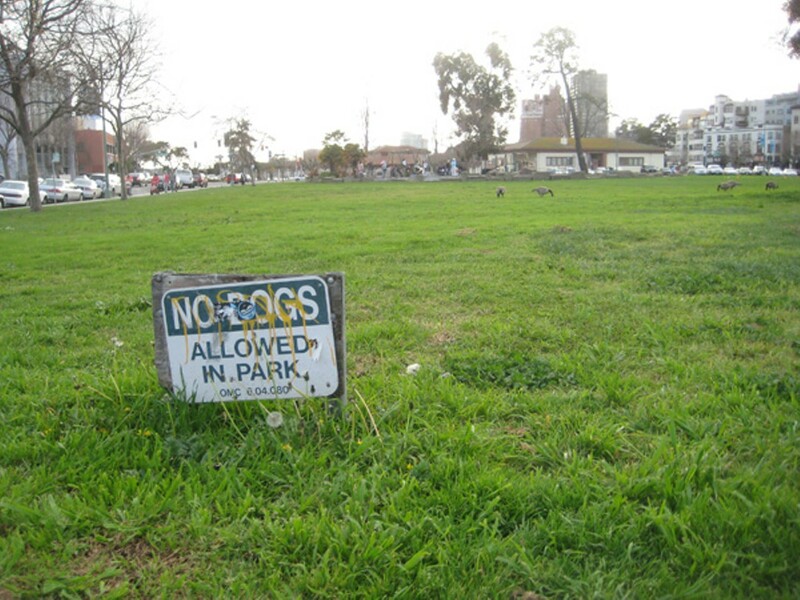 But opponents of the proposed Lakeview Dog Park at the north end of Lake Merritt say they have a good reason: The high-visibility location is simply inappropriate for a dog park. Now, as opposition to the park has mounted in recent weeks, heated arguments, emotional missives, and brazen name-calling have swelled on online neighborhood forums. Councilwomen Nancy Nadel and Pat Kernighan have stepped in to moderate. The only question left is whether the long-awaited dog run will ever get built. The Lakeview Dog Park has been in the works since 1998. Dogs are not currently allowed off-leash anywhere around Lake Merritt, and are banned from all of its green spaces. The notion of a dog play area near the lake was first integrated into the Lake Merritt Park Master Plan in 2002. Oakland's Parks and Recreation Advisory Committee approved the park in 2006, but cost concerns stalled the project. This past December, the park appeared to finally be on the verge of breaking ground after receiving approval from the committee a second time. But now, even if the park succeeds in gaining final approval from the city, it won't be without a bitter, divisive fight. The opponents' view is clear: Dog parks are great, but the location's all wrong. Planned for the northeastern corner of Lakeside Park, where MacArthur Boulevard and Lakeshore Avenue meet, the 21,000-square-foot run would occupy one of the most visible and highly trafficked intersections in the city. It would also require a portion of a popular playing field to be fenced off and covered with wood chips. Steve Saffold, who owns a dog and lives in the nearby Cleveland Heights neighborhood, is concerned about the loss of green space at what he considers to be the heart of Oakland, where people come from miles around to enjoy the outdoors, eat, drink, and shop. The dog park would be immediately visible from the Grand Avenue freeway off-ramp, adjacent to a popular child's playground, and across the street from the weekly Grand Lake Farmers' Market. "This is about a land-use choice at maybe the key location in all of the city, whether to keep this precious resource of unprogrammed open space that we already have," he said. "We have this, in the greatest location in the city. And it looks like we're going to surrender it to a fenced, wood-chipped dog area. That just seems like a questionable land-use choice for the future of the city." Saffold and a number of other concerned residents have banded together to spread the word about the current plans. A new Facebook group called Save Astro Park, referring to the name of the nearby playground, has accrued about sixty supporters since forming in late February. Gilbert Vahanian, who also lives nearby, is among them. He doesn't have a dog, but says he plans to get one soon for his five-year-old son. "We do love dogs," he said. "We have lots of dog owners in the group. "No one has convinced me of the cost-benefit analysis of taking away the green space and replacing it with a dog park," he continued. "I don't question that we need to have an area for dogs, I just don't know if the work has been done, or I haven't been shown the work, that shows that's the best place for it." Opponents are concerned that the dog run could introduce unpleasant odors into a highly public area. They fear that a large concentration of canines in one space could pose a safety threat to toddlers and small children at the playground. And they worry that the already busy neighborhood would be unable to accommodate an increased demand for parking. Dog park supporters dispute their opponents on nearly every point. "I think people are worrying about an issue of appearance in the park that won't be an issue," said Emily Rosenberg, co-founder of the Oakland Dog Owners Group, which has worked on the cause for more than a decade, beginning with the collection of 740 petition signatures in 1999. The dog run's proposed four-foot cyclone fence would be covered with green vines, she said. "I think there will be very little visual impact on the park. It's going to look lovely." As far as the playing field goes, before Oakland Dog Owners Group got involved, the center of the lawn was too swampy for use, said Rosenberg, who lives in Montclair. In 2005, she said, her group worked with Oakland's Department of Public Works to fill in the middle of the field, mitigating any potential impacts of the dog run. Later, in 2008, the dog area's proposed footprint was reduced. On top of that, she said, it's planned for a corner of the lawn that sees very little activity, and would not impinge on other user groups. Still, Rosenberg concedes that the busy location may not be entirely ideal. "We did have many other choices that the dog owners might've preferred, but this is all the city gave us," she said. "This is a compromise all around." As the anti-dog-park contingent has begun to organize, Rosenberg and other dog park backers have garnered new support from nearby residents, many of whom have been polarized by the debate. Cindy Fong, who lives within walking distance of Lake Merritt in Cleveland Heights, said she initially had concerns about losing part of the lawn area, but now falls firmly on the pro-park side. "It's a good thing for the neighborhood," she said. "For the benefit of losing a little green space, it's a big plus." Word of the controversy made its way to the offices of Nadel and Kernighan, and now both have stepped into the fray. Nadel, who did not respond to requests for comment, has posted in support of the dog park on neighborhood forums. "Please be respectful of years of other people's work that hasn't always been on everyone's radar screen because of limited funds but is now finally coming close to fruition," she wrote to a Cleveland Heights group. Nadel also announced that if this proposal doesn't go through, she won't be able to provide additional staff time or money in search of a new location on Lake Merritt. Kernighan, whose district is adjacent to the proposed dog park's border, says she's concerned that constituents were not adequately consulted during the ten-year planning process. "In retrospect, it's clear that the planning was done by an energetic and well-intentioned group of people, but there was not very much outreach to the broader community about it," she said. Since inviting residents to e-mail her their opinions in late February, she's received hundreds of responses, she said, with opponents initially outnumbering proponents by a wide margin. In order to invite further public discussion of the dog park, Kernighan has set a community meeting for Wednesday, March 23, in Lakeshore Avenue Baptist Church's Barnett Hall (3534 Lakeshore Avenue, Oakland) at 7 p.m. Nadel, as well as four neighboring community associations, will also be present. The Lakeview Dog Park's construction is still pending a minor conditional use permit from Oakland's Planning Commission and approval from both the Life Enrichment Committee and the full city council. Saffold is happy to see the increased attention. "Anybody who lives in Oakland should care about this space," he said. "This is a place where Oaklanders from all over the city come to spend their leisure time. It's incumbent upon people to treat it that way."